Every function is within easy reach with the manually adjustable front panel, large 4.3 inch LCD display and simple interface. The clear buttons mean quick access to the printer’s primary functions, whether that be printing, copying, scanning or faxing. • Experience a lean, space-saving design. Clever contrasting textures, rounded corners and tapering contours make the printer’s already-small frame appear even smaller. 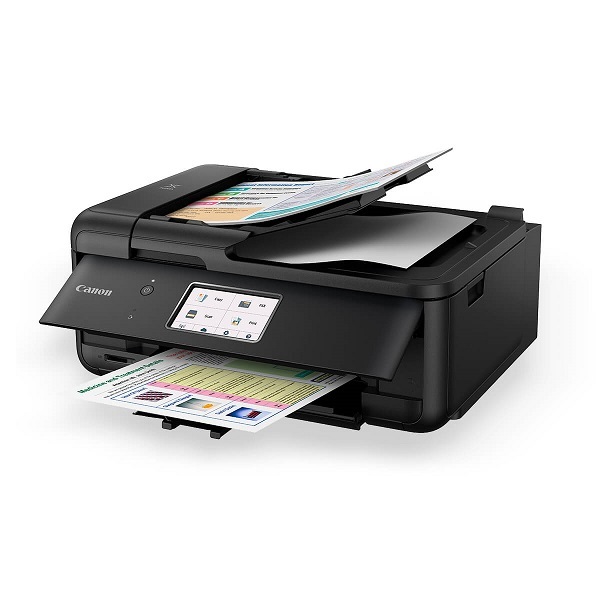 A superb printer inside and out – and an elegant addition to any desk or home office. 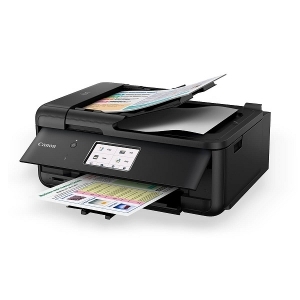 • Print quality documents with sharp crisp text over USB cable, Wi-Fi, Wired LAN or Bluetooth. Its document removal reminder, 2 way paper feeder in addition to duplex print via ADF makes printing at home easier than ever. Not to mention that Canon’s inkjet print technology and 5 single inks bring convenience, cost savings and great-looking prints.